A camel’s hump does not store water. It stores fat, which lessens heat-trapping insulation around the rest of the body. One reason they can go long periods without water is the shape of their red blood cells. These are oval and hence will flow when they are dehydrated rather than clump as human cells do. 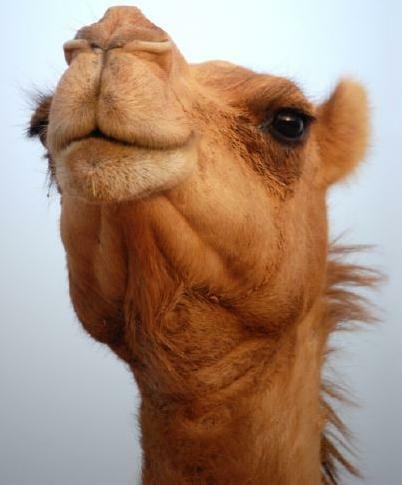 The camel is the only mammal that has oval red blood cells. Camels’ lips are split to help them graze. They can eat thorny twigs without injuring their mouths. They can close their nostrils against wind and sand when necessary. The shape of their nostrils allows them to retain water vapor and return it to the body as fluid. Their coat reflects sunlight and provides insulation from the desert heat. One of the camel’s defense mechanisms is ‘spitting’ whereby they essentially throw up a foul smelling greenish fluid from their stomach all over the aggressor when provoked. For those who have experienced it, it is an experience seldom forgotten. Camel feces are so dry they are used for fuel and their urine is as thick as syrup. A camel’s kidney plays a part in helping the camel go for a long time without water: it concentrates the urine—some camel urine could be as thick as honey. The camel’s thin legs are strong enough to carry not only its body weight (which could be over 1,500 pounds), but also loads of cargo weighing 500 to 1,000 pounds. Camels have straight spines, despite their humps. A camel has two toes and a pad on each foot. These leathery pads spread as the camel walks on the desert sand making it easier to walk on soft sand without sinking. A camel can withhold 17 days without drinking under a scorching heat. It was wrongly believed its resistance resided in the water kept in the hump or in a stomach pouch. If it doesn’t drinking anything for 17 days, a camel can lose a third of its weight, without being affected. But when it catches the opportunity, it can drink 104 liters of water at once (the Bactrian Camel, which is larger, can drink up to 120 liters), in 7-8 minutes! But just three days later, there is no sign of water in its stomach or hump. In the aforementioned ayah, Allah (سبحانه وتعالى ) draws our attentions to one of His miraculous creation: the camel. We are asked to ponder upon the structure of the animal and look at how it is created, and given a unique form that makes it quite different from other animals. 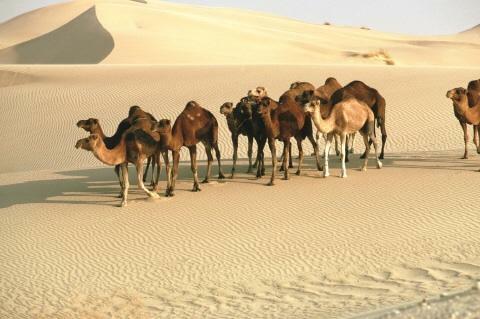 The unique features of a camel enable it to adapt to the harsh conditions of the desert. In the aforementioned ayah, Allah (سبحانه وتعالى )draws our attentions to one of His miraculous creation: the camel. We are asked to ponder upon the structure of the animal and look at how it is created, and given a unique form that makes it quite different from other animals. The unique features of a camel enable it to adapt to the harsh conditions of the desert. Feet: A camel’s feet constitute of two toes connected to each other with a flexible cushion, which enables it to grasp the land it walks on firmly. Its nails protect it from any potential damages that may occur as a result of blows. A camel’s knees are composed of skin as hard and thick as horns, protecting it from the scorching heat of the sand as it lays down to rest. 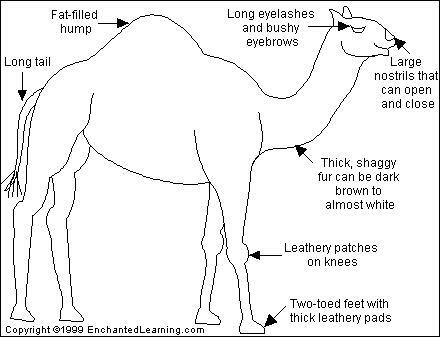 Hump: The hump of a camel is a mass of fats, and provides nutrients to the animal periodically in times of starvation. With this feature, a camel can live 3 weeks without water and loses 33% of its weight, whereas a human being in such a circumstance would lose 8% of his weight and die within 36 hours. Heat-insulating fur:This thick and felted fur protects the camel from the cold and hot climatic conditions and also protects it from water loss. With its thick fur, camels in Asia can survive high temperatures reaching up to +50° C in summer and falling down to -50° C in winter. Eyelashes: The eyelashes of a camel are created in such a way by Allah(سبحانه وتعالى ) that it prevents even a single grain of sand from entering the eyes. Nose and ears: These are covered with long hair preventing sand and dust from entering into them. Long neck: The long neck of a camel enables it to feed on leaves which are at a height of 3 meters from above the ground. Subhaan Allah! After reflecting on how the camel was created we can’t help but realize the perfection with which Allah(سبحانه وتعالى )has made His creation. Each part of the camel has been created to make it adapt easily to the harsh climatic conditions. Allah (سبحانه وتعالى ) is not only the Creator but also the Sustainer. Only He has the power to make such a complex creation and He also settles His creation in an environment where it can establish itself without complications. Not only has Allah (سبحانه وتعالى) placed the camel on earth as a sign but He has also created it to serve mankind. This entry was posted in Signs in the Universe and tagged Camel, Jamal, miracle, Sign. Bookmark the permalink. This was a interesting article related to the creation of the camel which is a very important animal since camels were used in the Prophet (pbuh) lifetime and people still use camels for errands. It is amazing how the camel is created and how Allah has created the camel. A camel is such an amazing sign of Allah swt.We should share these signs with the younger lot especially.